Low-cost Luer Lock Adapters are designed for a wide range of Statomix™ motionless mixers. These adapters screw to the tip of the mixer and facilitate the attachment of dispensing needles for precise application of fine beads or dots and to reach within small spaces. Three color-coded sizes of Luer Lock Needle Adapters are designed to cover the range from I.D. 5 to I.D. 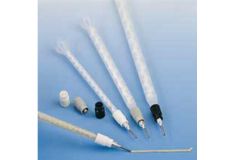 10 mixers and fit all standard Luer Lock type needles.